Kissinger’s Nobel prize has been widely criticized by those who say that he participated in war crimes during the Vietnam war. The 27 groups involved in organizing the protest were comprised, in part, of the NYC Democratic Socialists of America, NYU Against Fascism, and the NYU branch of the International Socialist Organization. "The event went forward as planned, but during the course of it, there were a handful of brief interruptions; those who stood up and shouted were promptly escorted from the room by our public safety officers," NYU spokesman John Beckman told Campus Reform on Wednesday. 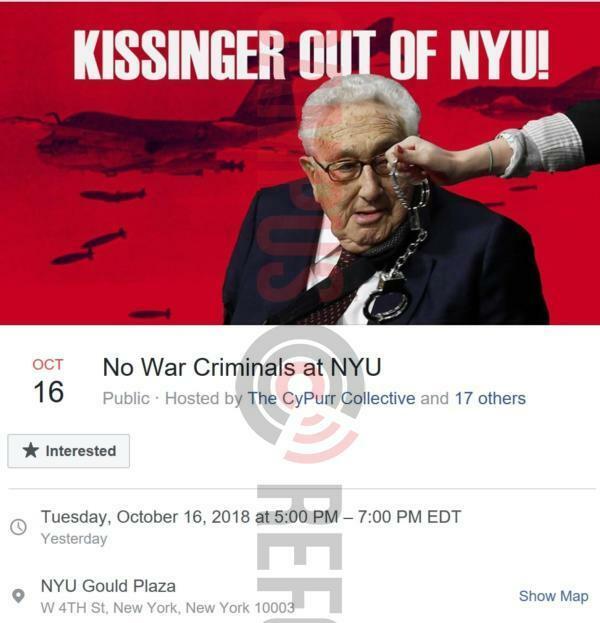 "Our rules are clear: NYU values and respects dissent, but it is impermissible for dissent to take the form of shouting down an invited speaker," Beckman added. "Those who do so make themselves subject to sanctions." A spokesman for Kissinger declined to comment when contacted by Campus Reform.